Russia must play an active role in helping to restore stability in the country. The question of whether Mohamed Morsi’s overthrow will become a blessing or a curse for Egypt is too multifaceted to answer in any one way, let alone with any serious degree of certainty. 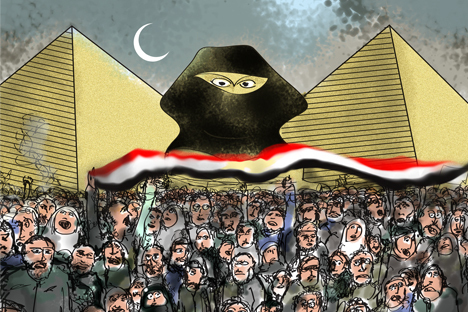 Yes, a new Egyptian revolution — albeit one galvanized by the army — has taken place. But, like any other revolution, including that which deposed Hosni Mubarak, it has only met the interests of a fraction of society. To what extent then can the other portion of society, which not long ago voted for the “first democratically elected” president and approved his proposed constitution on a referendum, accept what has just happened? Despite today’s euphoria, Egypt is entering a long and difficult period of turmoil — one aspect of which will be the Muslim Brotherhood's future electoral success, at the expense of its scattered opposition. Abdul Fattah al-Sisi’s announcement of the president’s removal from power and the army’s “road map” has not removed from the political framework those parties that continue to appeal to religion. The reasons that drove a portion of Egyptian society to resort to revolutionary violence once again appear to be justified: The president's opposition has been decrying the state's “Islamization,” while stressing the Freedom and Justice Party’s inability to meet citizens’ expectations for the economy. Of course, establishing total control over state institutions and removing political opponents formed much of the basis of the Muslim Brotherhood’s policies. But wasn’t Islam a political action tool for opponents of the deposed president at some point, as well? Didn’t the ostensibly “liberal” New Wafd party, allied with the then-banned Muslim Brotherhood, introduce an amendment to Hosni Mubarak’s constitution fairly recently, to make Sharia the “main source” of the law? It would be wrong to assume that opposition groups bear no responsibility for the domestic, political instability or lack of investment. Even if they come out on top of the power pyramid (is there even a leader recognized by all opposition groups? ), they will face the same problems: security and the economy. These will be hard to solve if for no other reason than the new government will have to agree on a common platform that would include not only the demand for “overthrowing the Islamists,” but also a program of economic reform — which would likely be unacceptable for their current supporters. Moreover, in order to take power, the opposition groups will necessarily have to rely on the army, thereby discrediting the very idea of democracy for many Egyptians for a long time to come. Egypt is experiencing powerful external pressures today. They are conflicting, to say the least: Where the West is demanding that the country return to the path of “democratic development,” Egypt’s neighboring Gulf monarchies are feeling all but a sense of relief from the end of Morsi’s rule. The West’s stance is understandable. But an unprecedentedly warm congratulatory telegram from the Saudi king addressed to Adly Mansour and Abdul Fattah al-Sisi, stressing that Egypt had finally “been carried out of the darkness of a dungeon,” only proves the Saudi leadership’s attitude toward the Muslim Brotherhood in Egypt and its “national sections” in other Arab countries. This stance is admittedly understandable, as well; Saudi Arabia, the proponent of the “Salafi state” model, the “Blessed-by-God Land of the Two Holy Mosques,” could hardly reconcile the challenge posed by a political force that, while claiming a religious affiliation, had come to power using a democratic electoral process borrowed from the West. Now this challenge seems to have been removed “by the hands of men of the valiant Armed Forces,” the telegram from Saudi Arabia read. The Gulf monarchies’ implicit desire is for the Islamists to follow Algeria’s National Salvation Front's example, landing them in the waste bin of history. Would Saudi, Emirati, Kuwaiti, or Qatari money then flow to Egypt? Egypt will most likely receive aid — probably substantial — from the Gulf monarchies, which have always treated it as their strategic ally. But would the aid be sufficient to overcome the effects of the current critical economic situation, given that Egypt, unlike Algeria, has no sources of strategic raw materials to speak of? Would Egypt, relying on such aid, be able to forgo assistance from the International Monetary Fund and its tough-love approach to crisis management? Positive answers to all those questions are far from apparent. Moreover, given the mixed nature of the various external pressures following “the second Egyptian revolution,” it seems wise to accept that the turmoil awaiting Egypt will be harder than can be predicted today. Finally, an observation that has no direct bearing on the questions posed above. Russian experts have been talking if not about the “conclusion,” then at least about “the approaching end to Islamic rule” in the Arab world. This opinion carries some truth. The number of countries whose leaders appeal to the power of religion has declined, and developments in Egypt have certainly sent a message to other “national” sections of the Muslim Brotherhood. The problem is more complicated, however. The Russian expert community is assessing “the second Egyptian revolution” based on considerations related not to the Arab world, but to the hidden or manifest concerns about the potential external — and naturally negative — impact of a brand of Islam perceived as “non-traditional” (for Russia) on Russia’s Muslim community. But perhaps a different approach is needed: The long period of difficult shocks Egypt is entering will require Russia to play an active role in the country’s affairs, as well, if it really wants to maintain its status as, for example, a G8 member. But will Russia be able to do this and maintain (or restore, depending one's point of view regarding the question) its influence in a region, which it still — albeit sporadically — perceives as being within its sphere of interest? Grigory Kosach is a professor at the Russian State University for the Humanities.